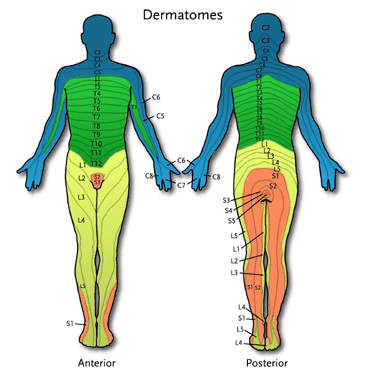 The diagram shows the areas of the skin (dermatomes) that carry sensations such as touch, pain, temperature and position sense through specific nerves to the brain. These nerves, known as sensory nerves, provide electrical feedback signals to nerves that are designated by the numbers on the diagram. 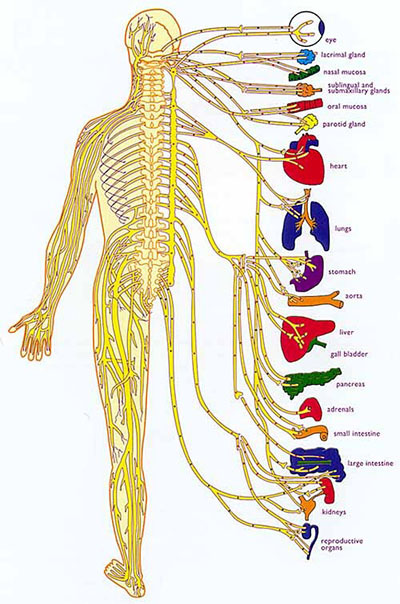 Interference of these sensory nerves is found in various conditions. It should be noted here that these and other sensory nerve-related conditions have been shown to respond well to chiropractic adjustments, which improve nerve signaling to these dermatomes. A healthy nervous system is both structurally and functionally sound. 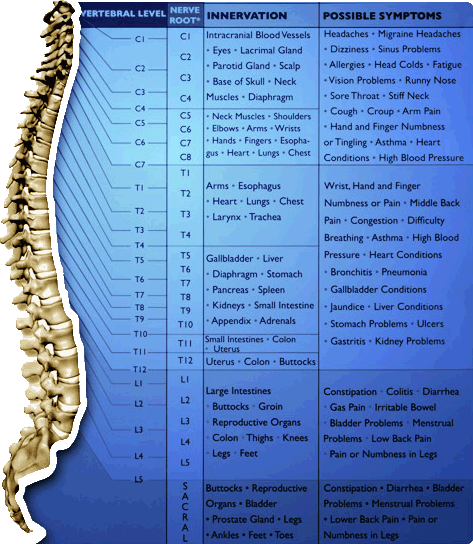 When irritation and inflammation is present the nerves cannot function as well and this can lead to spinal and muscular pain as well as cause issues to the underlying organ systems as demonstrated on this chart. As with all parts of your body, nerves are made up of cells; all cells require vitamins, minerals, enzymes and other nutrients in order to be healthy. Structurally healthy nerves are capable of freely carrying electrical information to and from all parts of the body. The imperative word here is capable, because a nerve must be both capable and electrically functional in order to be effective. The functionality of a nerve has to do with timing and how effectively it transmits nerve impulses. If there is underlying interference present such as inflammation from an injury or repetitive trauma, these nerve impulses become corrupted and can alter signals going to the spinal joints and muscles. Often times one may experience joint pain and stiffness caused by altered spinal nerve patterns. Chiropractic adjustments can help to inhibit these signals and restore normal joint pattern motion so the nerve will become less irritated and healing can take place at the level of the spinal joint and muscular system. The “subluxation” was a term used by the early chiropractic profession to describe misalignment of the spine causing spinal nerve impingement as an underlying cause of pain and dysfunction. The modern day subluxation (not that many chiropractors still use the term subluxation anymore) refers to a collective description that can include one or more of the following affecting spinal joint function: Loss of motion, joint restriction, degeneration, anything altering the function of the spinal joint (e.g., post injury inflammation and swelling), facet joint dysfunction, disc lesions, ligamentous failure, muscle inhibition, spinal nerve irritation as well as the nociceptive nerve receptors firing from mechanical and chemical stressors. Underlying emotional stress, inflammation and even immune system challenges (e.g., Lyme disease) can also alter the physiological function of the spinal joints and cause pain as a result. 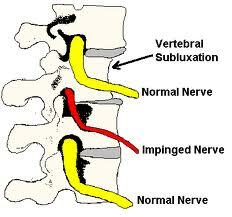 The chiropractic profession has been extensively trained to handle the vertebral subluxation. As our society has evolved so has our stress and they way we live and do things. The demands on our body are much different now as compared to living in the 60’s, 70’s and 80’s. Now, with the ever increasing data and technology, chiropractors are more equipped to handle the subluxation than they ever were. An improperly functioning nerve will transmit an electrical signal that is too low or too high, which will result in organ dysfunction and/or a pain response. Remember, signals are synonymous with information. Since nerves carry signals to and from organs, an organ that is in poor health for any reason can usually be helped or enhanced by a chiropractic adjustment to the corresponding vertebrae.